TV Land as a cable network was created as a home for classic television series from the past. Spawned from the surprising success of Nick at Nite, TV Land became a full-time haven for shows like All in the Family, I Love Lucy, The Ed Sullivan Show, M*A*S*H, Roseanne, The Brady Bunch, The Andy Griffith Show, the Beverly Hillbillies and funny retro-commercials. Hot in Cleveland is the network’s first attempt at creating its own scripted series. It seems like a bit of an odd move, simply because the idea of new, fresh, non-rerun entertainment sort of flies in the face of the network’s “all nostalgia, all the time” credo. That’s not to say that it is out of the question for a cable network to reinvent itself. Can you name the last time that TV Land’s sister network MTV-Music Television actually played music? 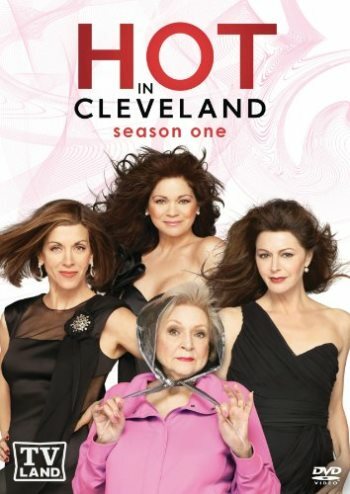 However, I have to admit, while Hot in Cleveland is a cute and mostly funny little sitcom, had it not been created by TV Land it would probably not have been quite good enough to have made the cut on TV Land. They put together a dream cast with strong TV backgrounds: Valerie Bertinelli (One Day at a Time, Touched by an Angel), Wendie Malick (Just Shoot Me, Jake in Progress), Jane Leeves (Frasier, Murphy Brown) and Betty White (The Golden Girls, The Mary Tyler Moore Show). In fact, Hot in Cleveland has the sort of old-school semi-naughty feel of White’s old series The Golden Girls – if only the girls were about a decade or two younger. The cute – or is it cutesy? – premise behind Hot in Cleveland is as simple as it is unbelievable. Three hot, fortyish Beverly Hills girlfriends – one an acclaimed soap opera actress named Victoria (Malick), one a best-selling writer named Melanie (Bertinelli) and one the beautician to the stars named Joy (Leeves) – are literally dumped in Cleveland when their plane to Paris must make an emergency landing. While visiting they are seduced by the city’s white bread charm: the normal people, the fatty foods, the extremely low prices, the big-box stores and the fact that unlike in Hollywood, there aren’t a whole busload of 20-ish struggling actress/models to divert men’s attention from them. Of course, there are down sides, too. The nearest Neiman-Marcus is in Chicago. On a whim, they decide to rent a huge Victorian home (7,000 square feet!) and completely uproot their lives to start anew in the new town. That home comes complete with a caretaker (“Whatever that means,” Melanie correctly assesses upon hearing of it). That caretaker is Elka (White), an 80-something year-old woman who has been working and living there for over 50 years. Elka is crotchety and judgmental (“Why are you renting to prostitutes?” was her first question to the realtor upon meeting the new tenants), but eventually turns out to be funny and likable. White is her normal funny self in the role. Though I have been resisting her since lately it has been decreed that Betty White must be everyone’s favorite senior citizen, I have to admit she does have a way of popping into a scene, delivering a devastating line and exiting stage left. However, the surprising heavy hitter is Jane Leeves, who had been so funny on Murphy Brown and on most of the run of Frasier, until the whole Niles and Daphne thing became sappy and ruined her role. Leeves gets less to do than her co-stars, but she is as funny, smart and beautiful as any of them. Joy is the classic forty-ish woman who put her career over a relationship: “I owe my mother a son-in-law and grandchild, I know because she reminds me every two minutes.” She decides to pull up stakes and go to Cleveland when she realizes that Oprah has forsaken her salon for the new Russian beautician in Beverly Hills. “Damned foreigners,” she says in her distinctive British accent. Joy: Forty is the new thirty. Victoria: And fifty is the new forty. However, as much as they obsess and gripe about growing old (“my real age!” as Melanie euphemistically puts it), they grow and learn from their experiences. Yes, there is hugging and learning here. Perhaps the show became a hit on TV Land because it is so determinedly pre-Seinfeld. All in all, Hot in Cleveland is not all that innovative or imaginative, but it is lovingly nostalgic and sometimes surprisingly funny. I guess you shouldn’t expect anything else from TV Land. Copyright ©2010 PopEntertainment.com. All rights reserved. Posted: December 27, 2010. Tags: All in the Family, amy yasbeck, Betty White, Cafe Americain, carl reiner, classic tv, dw moffett, Frasier, Hal Linden, hot in cleveland, Huey Lewis, I Love Lucy, Jake In Progress, Jane Leeves, Joe Jonas, John Schneider, Juliet Mills, Just Shoot Me!, mash, Murphy Brown, Nick at Nite, one day at a time, PopEntertainment.com, Roseanne, shirley knight, The Andy Griffith Show, The Beverly Hillbillies, The Brady Bunch, The Ed Sullivan Show, The Golden Girls, The Mary Tyler Moore Show, Tim Conway, Touched by an Angel, TV Land, TV on DVD, TV on DVD Review, Valerie Bertinelli, Wayne Knight, Wendie Malick. Bookmark the permalink.